Get the most out of your PowerPod with the PowerStroke Upgrade! Most cyclists wobble on their bikes far more than they should. Excessive wobbling can be a result of improper bike fit, frame size/type, and pedaling style—either singly, or most often, in combination. 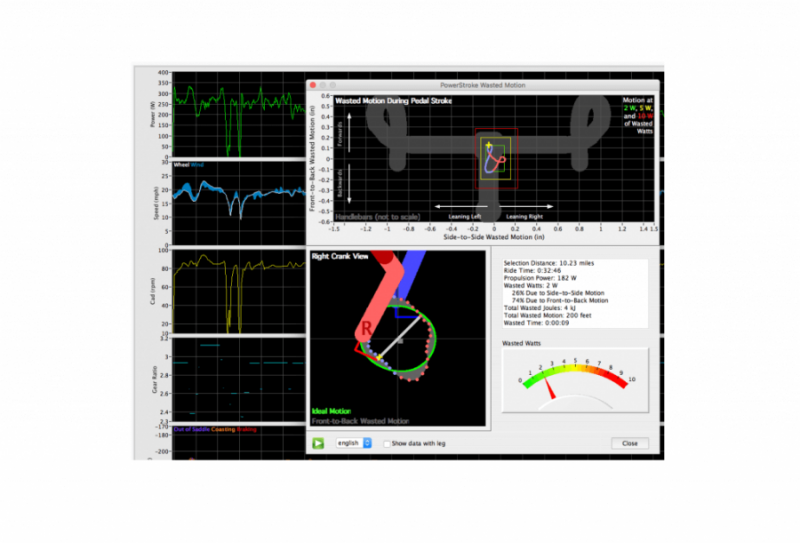 The PowerPod PowerStroke Upgrade Key is Velocomp’s exclusive measurement suite of front-to-back, side-to-side, and left/right wobble motion of the bicycle, and the analysis of the Wasted Watts, Wasted Motion, and Wasted Time caused by wobbling. PowerStroke compares your actual wobbling to the smooth motion of top cyclists, showing you if your wobbling is excessive. By reducing excessive wobbling, you can reduce your wasted motion/watts/time, and become a better, more economical cyclist. PowerStroke works by adding new technology both to your PowerPod and to (free) Isaac software for Mac/PC. With the PowerStroke key installed, your PowerPod records its data at high speed (16 times per second), vs. the typical once per second rate of conventional power meters. Then, Isaac software analyzes the high-speed data, determining the front-to-back, side-to-side and left/right wobbling motion of the bike each 10 degrees of a pedal stroke. Wobble measurements and associated Wasted Watts, Wasted Motion, and Wasted Time stats are shown in Isaac’s PowerStroke window. You’ll see your actual, on-the-road PowerStroke, allowing you to experiment with changes to your pedal motion, bike position, and more, to improve your riding efficiency. Powerstroke rocks. I have been loving my Powerpod so I decided to take things up a level. Even after purchasing my Powerpod and Powerstroke, I have still spent less than had I bought just about any other power meter. The data Powerstroke gives you is really cool. I’m still getting used to it but for $99, you cannot go wrong if you are serious about training with a power meter. Tom, thank you for the review. We agree, for less than $400, the Velocomp PowerPod with PowerStroke gives you a pretty dynamic power meter at a great cost. Enjoy.